The Severe Tampa Bay Drought– What it Means to You. As wildfires continue to blaze in our area, the drought continues to dwindle our Tampa Bay water supply. During hot weather, an abundance of groundwater is desperately needed to keep local lawns, landscapes, and gardens green and healthy. If this 2017 Severe Drought continues to persist, we will be heading towards an Extreme Drought. From the map below, our Tampa Bay drought situation can seriously affect your lawn and landscape by creating brown spots and dead grass and shrubs. 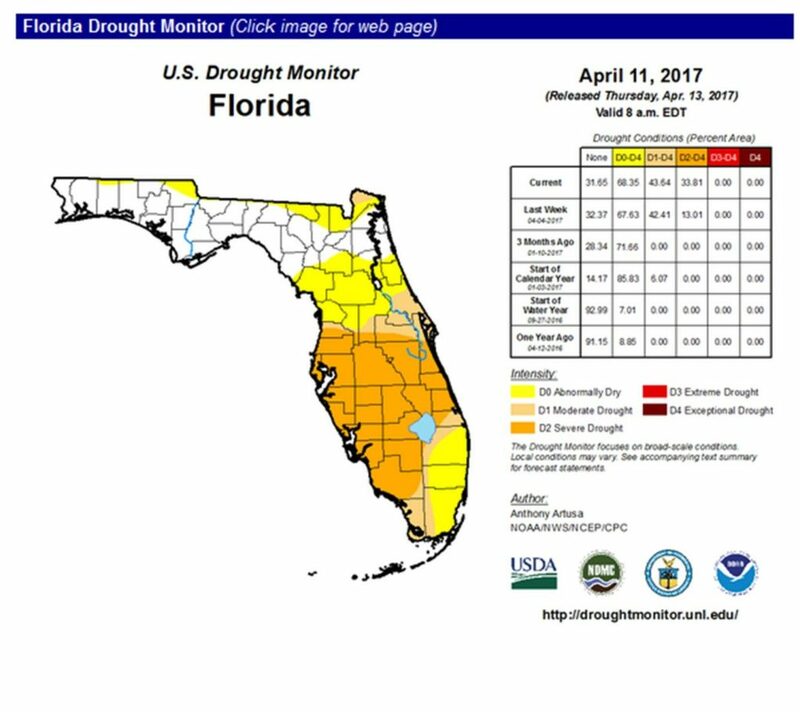 To learn more about Tampa Bay & Florida’s Latest Drought Information, click on the map to connect to the National Weather Service. Are We Heading for the Toughest Watering Restrictions in Tampa Bay’s History? As you can see from the map above, the Extreme Drought can mean brown grass as the norm. Local government officials are now considering what actions to take to conserve water and restrict the squandering of water. Homeowners are also concerned about how to keep their lawns and landscape healthy, while in the drought or during constricted watering restrictions that may go to one day a week or no watering at all for an Exceptional Drought. What Can You Do to Beat the Drought? There are a number things you can do to save water and get water to those areas of your yard and landscape that needs it. We recommend in this drought situation, you proactively inspect your lawn and landscape for dry areas and any brown spots and immediately take appropriate actions to ensure automatic irrigation watering is correctly performed and the soil is moist below the surface. As you may know, you can always call us in to check out your entire irrigation system to determine any failed components or adjustments required, as well as, the quality sprinkler repairs we have been recognized in Tampa Bay for the past 27 years. Your irrigation sprinkler system must be in good condition to water properly and efficiently without wasting water on sidewalks or driveways to beat this Severe Drought. ATZ Irrigation has provided a few helpful tips below to maintaining a healthy lawn and landscape while exercising conservation of Florida’s most valuable limited resource – Water. Mulch: Distribute a minimum of 3 inches of mulch in landscape areas to help seal in the soil moisture, prevent erosion and prevent weeds. The biggest impact to water conservation and keeping your lawn and landscape green and healthy is a fully functional irrigation sprinkler system working at peak efficiency. A well-maintained and correctly operational system can save your grass, plants, shrubs and tree from dying from the drought and it can also save you money. Call us (727) 937-7177 or complete Our Service Request Form for Fast and Reliable Sprinkler Repair service. We Do Irrigation the Right Way! Please select the options that best suit your needs? Do you have Images of the project or damages? Upload a photo, map, drawing or blueprint anything that could help assist our crew offer you the absolute best service. Highly recommend ATZ for all your irrigation and landscape lighting. Quick and reliable!! They were very knowledgeable and helpful making sure I understood the problems they solved. Thanks so much! Great company! Outstanding service! Would recommend if you are looking for an irrigation company. Very friendly staff. Great company! Guys are friendly and know what they're doing. Will definitely recommend them to anyone needing installation and/or service for their home or business sprinkler needs. Had the best experience today with this company. We just moved in to our home in Odessa July 2016. 1st home we had with 11 zones of sprinklers. Most heads didn't work and the sod guy cut a feeder pipe yesterday which prompted my call to ATZ (the only company to that actually answered the phone). Within 12 hrs someone was here and very helpful / knowledgeable to fix the problems. He even helped me figure out the control panel. Thanks ATZ! I rarely give ratings but really need to hear because they did such a great job . I had my 5 acre estate landscaped, irrigated and the outdoor lighting done by ATZ Irrigation and it came out beautifully. They had installed a new 2 horse power pump to my existing deep well because I was not getting enough pressure to run all 26 zones for the sprinklers, once this was done the sprinkler heads were blasting water to cover every square inch of my property, then they also installed my landscape lighting throughout the front two and a half acres of the property. Up-lighting on the beautiful pine trees created a dramatic effect at night. it was a pleasure working with Tom and the entire crew at ATZ, they were very friendly and went above and beyond to make me happy.. I would highly recommend them! ATZ is Amazing they show up on time and ready to go. These boys really know what they're doing. Highly recommended! Very professional and great rates! We are very pleased with our sprinkler installation from ATZ Irrigation. The install was done in a day and set up of the controller and training on it use was simple and straight forward. A few days later when one of the heads had an issue a tech was onsite within hours to remedy the issue. It has been flawless ever since. We highly recommend ATZ Irrigation to those looking for a quality system and great customer service. ATZ Irrigation was extremely profession, knowledgeable and courteous. I will recommend them to my friends and neighbors. I have always had exceptional service from ATZ and would not hesitate to recommend them to any and all. #1 Best in lawn sprinkler repair & lawn irrigation installation throughout Tampa Bay. Copyright 2016 ATZ IRRIGATION -Developed by Web Reactor.